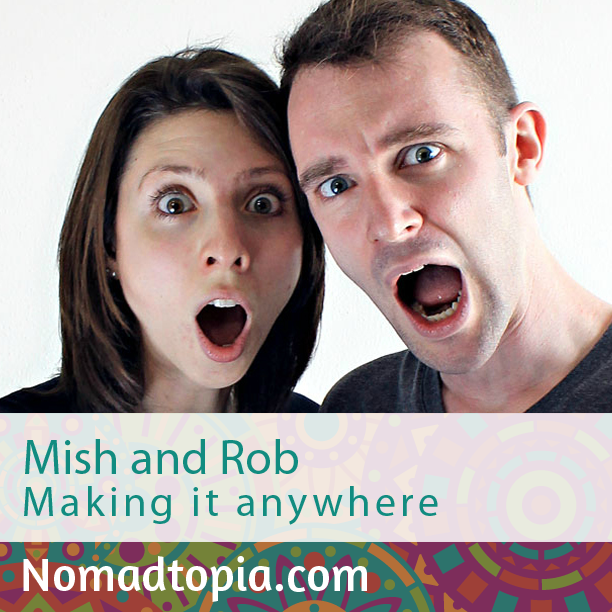 What started out as a six-month career break for Mish and Rob turned into a lifestyle. They typically spend a few months in each place they visit so they can live like locals, exploring the city while running their copywriting business and a location-dependent real estate business back in the UK. We lived in Prague for a month in 2014, during which time we launched the website for our new property management company. The wifi in our apartment was horrendous, Rob was really suffering with his asthma, we didn’t like Prague, it was hot, and everything was just going really really wrong! On the night before the launch, Rob was up until 3 am sitting on the steps outside the cafe beneath our apartment, leeching off their wifi while wheezing and sneezing like mad (he had hayfever too), trying to get the darn site live. It wasn’t fun at all, but for some reason we find it hilarious when we think back about it! – Realising how little stuff we actually need to live our lives and run two businesses. – Being able to hang out with each other almost 24/7 and still liking each other as much as before. – The wonderful friendships we’ve made with like-minded people (we never expected we’d come across people and adore them quite so much, quite so quickly—and how little it mattered that we could go months without seeing them in person). – Dealing with the guilt of not being back home seeing family.